Getting back to that ‘long story’. I’m not totally sure which came first- my neighbor asking me about Plexus or my fan on my google plus. But what happened was, my neighbor, knowing that I’m into this whole supplement scene (she’s always asking me what the colorful drinks are that I’m drinking on my deck while listening to loud ‘pump up’ music lol), but she asked me about Plexus because apparently she either knows, or is related to a ‘Plexus Ambassador’, basically someone who’s job is to make sales for Plexus and help spread the Plexus marketing. So basically it’s like Beachbody or Isagenix, or Herbalife. All the brands that typically make lousy products. I was kind to her in my answer, but basically blew her off and then forgot all about it, except when LATER that SAME DAY one of my fans asked me about Plexus I was like. Are you kidding me. I guess I HAVE to do a Plexus review. And as luck would have it, my neighbor DID end up buying both flavors of the 96 Calorie Plexus protein shake. So lucky for you- I can give the full low-down on which is the best flavor of Plexus 96. What’s the Best Flavor of Plexus 96 Protein? 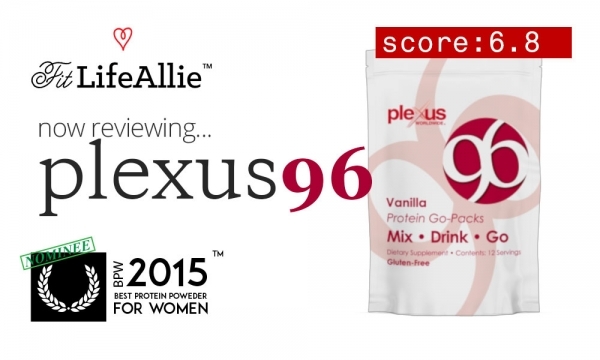 The best flavor of the Plexus protein is: (drumroll please!! ), the vanilla. So they have two flavors- for all you psychics out there, let’s put your skills to the test- what are they? You got it. Chocolate and vanilla. Boring and more boring. While some companies put out CRAZY flavors like ICE CREAM SANDWICH (see my awesome 1st Phorm Level-1 Protein Review), Plexus is clearly not on the forefront of creative flavoring technology. But I mean. Look at their branding and the way this company presents itself overall- it’s really so stale. It’s not good. And I was curious if the flavors were going to turn out ok or if they were going to taste old and stale like the packaging looks. The answer? Old and stale. Vanilla: The vanilla flavor of Plexus is boring. It’s not ‘bad’ per se, and honestly most folks who try it have never had a protein shake in their life ever before, so they don’t know any different and they are probably ok with it. Plexus went with a very straightforward interpretation of this protein though. It’s not very sweet, and not very strong in the actual vanilla notes. Just sort of meh. Chocolate: I found the chocolate to be a LITTLE bit better than the vanilla, to the point where I would say that the chocolate flavor is definitely the best flavor of Plexus. If you don’t know which one to go with - just take my word and get Chocolate Plexus 96. It’s sweeter than the vanilla and also has more overall flavor to go around. I actually would drink this one more than once. Overall the flavors are average. Chocolate is better, but neither one makes you want to tell your friend about the Plexus protein shake. That same sort of ‘averageness’ carries over to the formulation itself. But to wrap the flavor section- I’ll give it an 8/10 overall. So I guess there technically aren’t 96 calories but really 100. But so what. I’m fine with that number of calories. On top of the calories you have ALL KINDS of vitamins loaded into this product. There is Vitamin A, Vitamin C, and I’m not even going to try and type out all the rest. Tons of vitamins. All these are included so that Plexus can sell this Protein as a meal replacement. Moving into the protein section, there are a few things to be very concerned about. Well. Mostly one. Eh. Two. The first is minor and it’s the inclusion of maltodextrin in the product. Maltodextrin is a filler, and not a healthy ingredient by any stretch of the imagination. The next one is L-taurine- which is an amino acid. This amino could be dosed very highly, and thus contribute to the 15g of protein on its own when in reality it is not a complete protein but just a piece of it. This is a practice known as ‘amino spiking’ that other products use to cut costs. I’m not POSITIVE that this is the case with Plexus protein, but it does seem feasible. Let’s talk about packaging now. Ew. That’s what I said the first time I saw Plexus protein packaging when my neighbor dragged it out of her cupboard. I’m not entirely sure what was going through the head of the designer when they were designing the Plexus pouch, but it looks honestly worse than most of what I see, anywhere, at any time. The Plexus pouches are terrible to look at in every way. The colors are horrible and boring and stale. The feature graphic is just the number 96 in a horrible font with no spacing. It looks like a firetruck number and I truly despise it. Not firetrucks, the Plexus Protein packaging. The go-packs are convenient though, so that’s the only positive thing that I’ll say about Plexus Worldwide’s protein aesthetically speaking. But really I can’t stress to you how ugly the package looks in person. The red color is particularly a poor choice. It’s unbelievably bad. And that’s the ONLY color on here. Nothing else. Like. Are you kidding me? Strange choices all around. Let’s wrap this Plexus review right up.